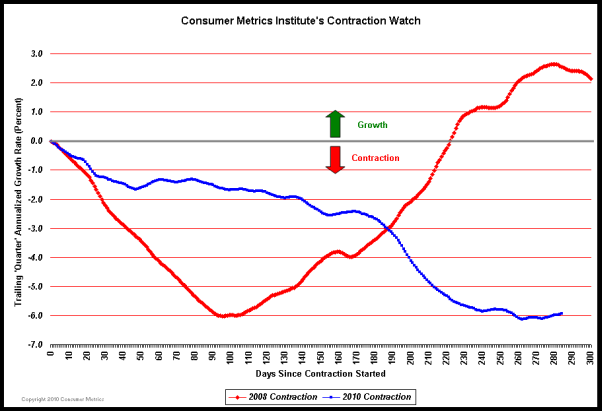 “We have not touched on consumer confidence for a good while, but now is the time. It’s time because of the certainty of QE ahead. Again, absolutely key question being, will QE2 positively influence the real economy? QE I was a strike out. And what of QE2? We believe a key indicator to watch as to whether QE2 will transmit to the real economy is the present conditions component of the headline consumer confidence index. Clearly the aim of QE2 is to inflate asset prices even further, let’s not beat around the bush about it. QE I inflated financial and commodity prices, but left real world prices of leveraged residential real estate and commercial real estate untouched. Moreover, QE I did not help headline consumer confidence recover. We’ll spare you the chart, but headline consumer confidence continues to rest at levels historically consistent with recession. Very quickly, the headline consumer confidence report is driven by two subcomponents that are present conditions and future expectations. Historically, the present conditions component of the headline number has been highly directionally correlated with the equity market over time. You can see exactly this in the chart below. Of course without the Fed overtly telling us this as a driver of their QE2 decision making, they are implicitly hoping higher stock prices (the assumed wealth effect) will engender accelerating consumer confidence, thereby motivating consumers to borrow and spend (or at worst just spend). 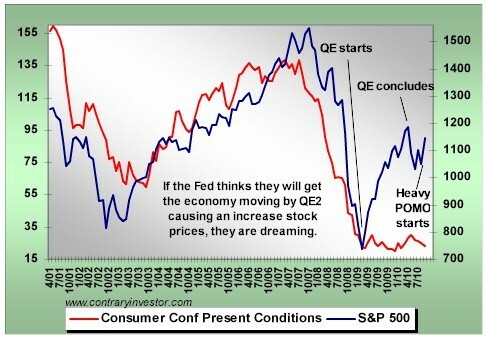 This likewise had to be a key rationale of QE I as the Fed is surely aware of this prior cycle linkage between stock prices and confidence in present conditions. This entry was posted in Intervention, Investor and tagged Consumer Confidence, Quantitative Easing, S&P500, Stock Market on October 31, 2010 by Ted Kavadas. This entry was posted in Investor, Stock Market and tagged markets, S&P500, Stock Market on October 27, 2010 by Ted Kavadas. Starting with my June 2 post I wrote of my expectation for a near-term stock market advance despite what I viewed as highly problematical future conditions. I continue to maintain this view, albeit with the dangers discussed in the post of October 13, “Comments On The Next Crash“. 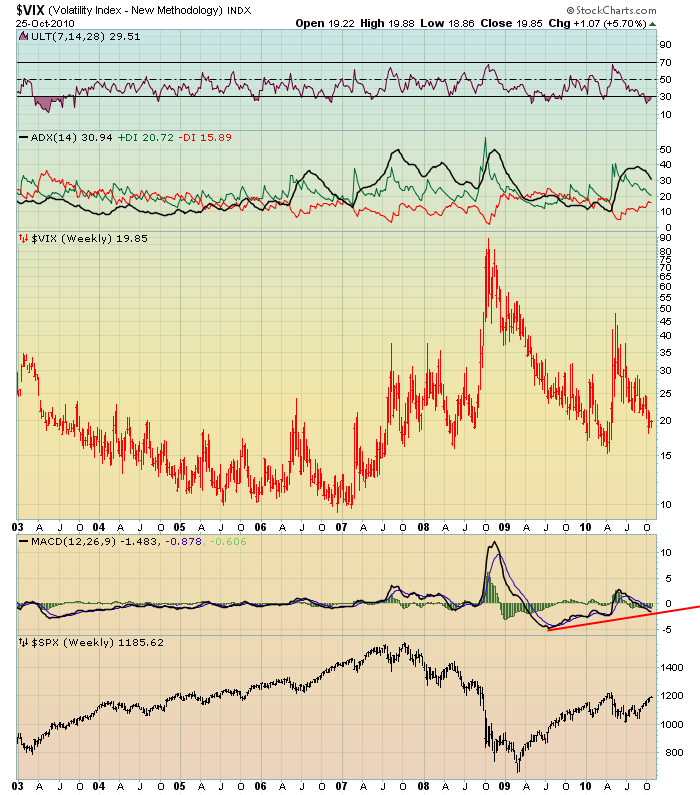 This entry was posted in Investor, Stock Market and tagged markets, Stock Market, VIX on October 26, 2010 by Ted Kavadas. The bond market is believed by many to be an asset bubble. I agree with this assessment, and have written a few posts on the subject. I discussed when it may “burst” and other considerations in an October 4 post. This entry was posted in Investor and tagged 10-year Treasury yields, bond bubble, U.S. Treasuries on October 26, 2010 by Ted Kavadas. I would like to start by featuring a couple of long-term charts of the U.S. Dollar. U.S. Dollar weakness is a foremost concern of mine. As such, I have extensively written about it. I am very concerned that the actions being taken to “improve” our economic situation will dramatically weaken the Dollar. Should the Dollar substantially decline from here, as I expect, the negative consequences will far outweigh any benefits. The negative impact of a substantial Dollar decline can’t be overstated, in my opinion. Next, onto the Japanese Yen. Up until 2-3 years ago, it was widely believed and (commented upon) that a rising Yen was a sign of danger. This belief seems to have diminished; however, the strength of the Yen has not. Is the rising Yen still a signal of danger in the markets? I believe that it is. Lastly, a Gold chart. I have written many posts about Gold. Of course, the most common question that arises with regard to Gold is whether it is in a bubble, which I have discussed previously. Certainly, the price action since 2001 would support such a claim. However, there is much more that should be considered before one can conclude that Gold is in a bubble. 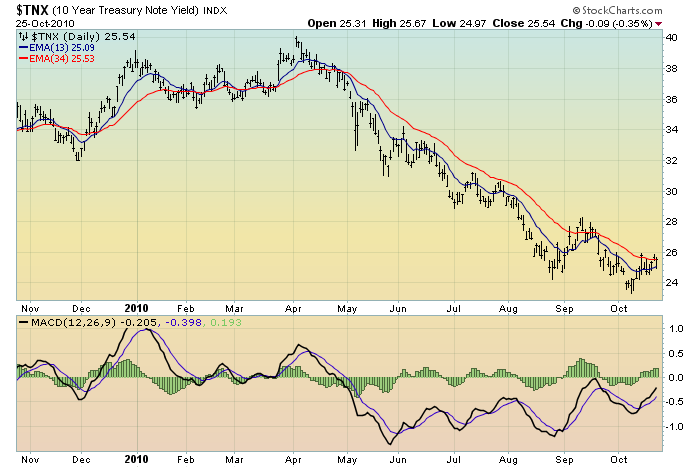 This entry was posted in Investor and tagged gold, Japanese Yen, markets, US Dollar on October 25, 2010 by Ted Kavadas. This series of blog posts (5 posts) represents a periodic Technical Analysis of the markets. In this series I will discuss currencies (US Dollar and Japanese Yen); Gold; The Bond Market & Interest Rates; and the Stock Market. I feel that this is an important juncture in investing for many reasons. Many markets have experienced strong gains recently, adding to what has been in many cases very strong performances since early 2009. Perhaps the main question at this point is whether such performance will continue across these markets, i.e. is such performance sustainable? I continue to be of the opinion that it is not. As I have commented previously, I view the stock market as experiencing a strong “bear market rally,” one that won’t and can’t continue. This dynamic of strong yet unsustainable performance is seen duplicated across many different asset classes. Further, as I have previously commented, my analysis indicates that many asset classes (on a worldwide basis) are full-fledged asset bubbles. This is admittedly an opinion held by very few. However, the ramifications of such are immense, both for markets and the economy in general. 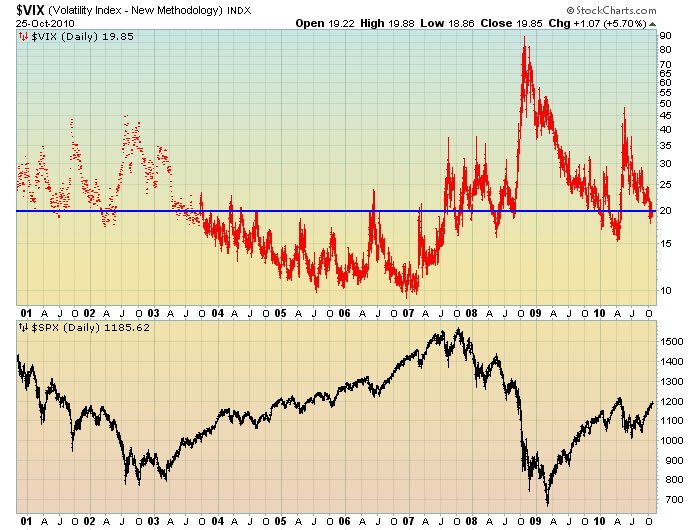 While this series of posts will focus on Technical Analysis issues, I will also provide reference links to previous comments I have made on these markets from both fundamental and technical perspectives. Before displaying some charts, I would like to make a couple of disclaimers. First, an extensive overview of all of my Technical Analysis observations would be very lengthy, and it would also infringe upon some facets I consider to be proprietary. As such, I will limit my observations, but I think most people will still get an overview of my thoughts. Second, I am aware that many people don’t believe in Technical Analysis. Even though I use Technical Analysis extensively, I will readily admit it is not infallible. As readers of this blog are aware, the majority of my focus is on fundamental aspects of the markets and the economic situation. This entry was posted in Investor, Stock Market and tagged markets on October 25, 2010 by Ted Kavadas. As one can see on this chart, real estate prices (here measured by the S&P/ Case-Shiller U.S. National Home Price Index) really started their ascent in the mid-90’s. In this chart it is again seen that the pronounced ascent in real estate prices began in the mid-90s. As well, as seen by John’s annotations, the market has experienced a roughly 30% fall from its peak, and a price reversion to the trendline from January 1976 would represent a further 15% decline. I have written extensively about various facets and dynamics of the residential real estate market. My analysis indicates that this is a market that is exceedingly complex, due to a variety of hard-to-predict factors. These factors include such issues as strategic default trends, “shadow inventories”, redefault rates, and the relatively new confusion concerning foreclosure propriety. As well, there is immense direct and indirect government intervention in this market, which presents further complexities. Assessing the future path of real estate prices can be done in a variety of fashions; as well, many different measures can be taken into account. There are reams of data on a myriad of statistics. For purposes of this post, I would like to focus on the price trends as shown in the two charts above and raise four issues with regard to the future of home prices. Although I don’t necessarily agree with the methodologies employed by these indices, they have common acceptance. The first issue I would raise is whether trendlines can be used to assess the trends of house prices. The issue is debatable. Whereas trendlines have proven validity in stock price movements, I would question as to whether such validity exists with regard to home prices. The second issue is whether such trendlines (assuming their use in housing trends is valid) will serve as “support.” I would offer that if the housing market is in a continuation of its long-running bull market, the trendline would serve as support. However, whether we are continuing a long-running bull market in housing is deeply contentious. 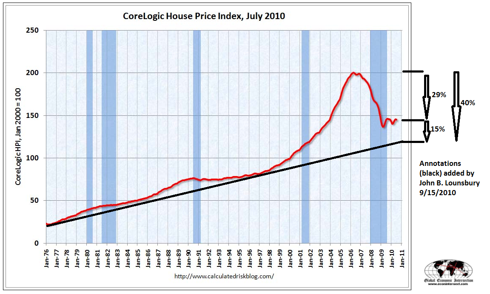 My own view on the matter is that the housing market peaked as shown and is now on a decline. As such, a trendline would likely not hold as support. The third issue is that of ultimate support; i.e. a price floor. Some believe that the “pre-bubble” price levels would serve as such a floor. For example, if one believed that the real estate bubble started in earnest in the mid-90’s, such a level would serve as the ultimate price floor. This seems logical as, in theory, the price inflation during the bubble’s excesses would be eliminated if the price were to return to the pre-bubble price levels. However, I think this is erroneous logic on many fronts. From a “technical perspective” it fails to consider a “reversion to the mean” that would result in a “price undershoot” to a level significantly below that of the prices of the mid-90’s. The fourth issue is one of “bubble dynamics.” Of course, the almost universal belief is that the housing bubble has “popped.” I don’t agree. As I have previously written, I believe the roughly 30% decline experienced to date, although incredibly damaging, is a “deflation” of the huge bubble as opposed to its “popping.” Further supporting this idea is that each index has only fallen to levels last seen during a latter year of the bubble, approximately the 2003 period. This “deflation” vs. “popping” nomenclature is more than semantics. If the bubble has only “deflated,” as I believe, then the “popping,” and its pronounced accompanying damage, still awaits. Lastly, one should keep in mind how supportive (ultra) low interest rates have been to real estate prices. While such low interest rates are widely believed to be stable for the foreseeable future, a substantial uptick in rates would likely prove a significant headwind against the possibility of rising prices. In summary, while many people have an optimistic view regarding future residential real estate prices, in my opinion such a view is unsupported on an “all things considered” basis. Furthermore, as discussed, there exists outsized potential for a substantial price decline, unfortunately. This entry was posted in Bubbles (Asset), Real Estate and tagged Real Estate, real estate bubble, residential real estate on October 24, 2010 by Ted Kavadas. 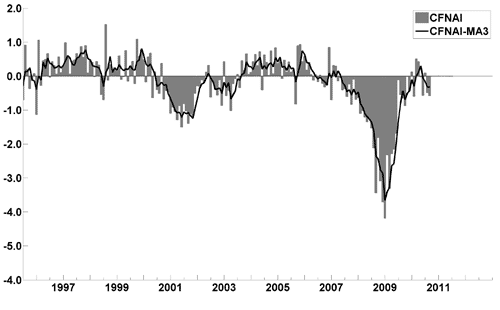 Here are four charts reflecting confidence survey readings. These are from the SentimenTrader.com site. I find these charts valuable as they provide a long-term history of each survey, which is rare. As one can see, these charts continue to show subdued readings, especially when viewed from a long-term perspective. These charts should be interesting to monitor going forward. Although I don’t believe that confidence surveys should be overemphasized, they do help to delineate how the economic environment is being perceived. This entry was posted in Uncategorized and tagged Consumer Confidence, small business on October 22, 2010 by Ted Kavadas. On October 1, I wrote a post about the Business Roundtable’s CEO Economic Outlook Survey and the Duke/CFO Magazine Global Business Outlook Survey. Subsequent to that post, the Conference Board released its 3rd Quarter CEO Confidence Survey. The overall measure of CEO Confidence was at 50, down from 62 in the second quarter. “Less than one-third say conditions have improved compared to six months ago, down from about two-thirds last quarter. In assessing their own industries, business leaders’ appraisal was also considerably less positive. Now, only 38 percent say conditions are better, compared with 61 percent last quarter. 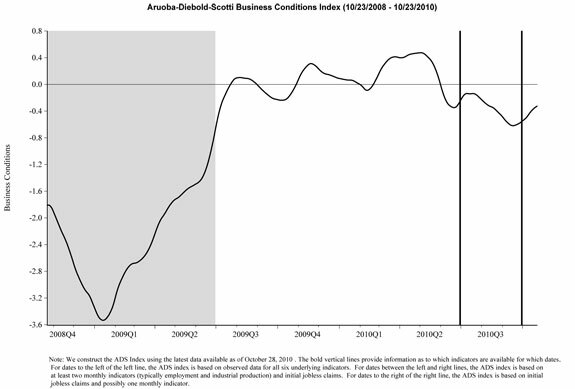 This entry was posted in Business, Economic Forecasts and tagged Business, CFO and CEO Confidence, Economic Forecasts on October 20, 2010 by Ted Kavadas.